McDonald Hopkins Government Strategies LLC is a wholly owned subsidiary of McDonald Hopkins LLC. The Energy Group at McDonald Hopkins invites you to join us Tuesday, Nov. 29 at The Athletic Club of Columbus for a Shale Update: 2016 Analysis and 2017 Forecast from 11:30 a.m. to 1 p.m. ET. Our panelists will discuss shale results from 2016 and what to expect in 2017. A legislative update will also be given by Zachary Frymier, Director, Energy and Environmental Policy, Ohio Chamber of Commerce. 12 p.m. to 1 p.m. 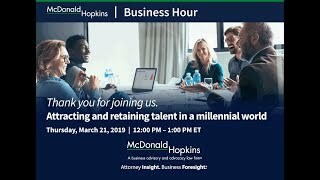 Please submit questions for the panelists to events@mcdonaldhopkins.com. 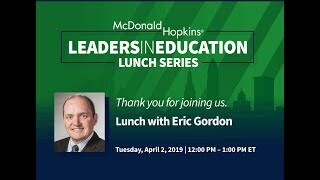 This event is sponsored by the Energy Group at McDonald Hopkins. For more information contact Mike Wise, Co-Chair, Energy Practice Group, McDonald Hopkins at mwise@mcdonaldhopkins.com or 216.430.2034. 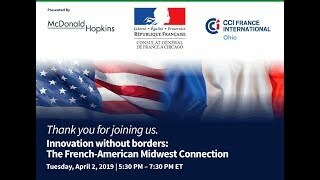 Please join McDonald Hopkins and the French American Chamber of Commerce (FACC) in Cleveland or via live webcast for "Innovation without Borders: The French-American Midwest Connection" with our special guest, Mr. Guillaume Lacroix, Consul General of France in Chicago. Join us via live webcast for a discussion on EKRA and it's impacts on the healthcare industry. 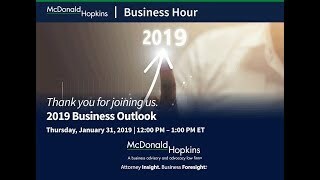 In an informative and practical Business Hour, McDonald Hopkins’ Ryan Neumeyer and Mike McMasters, a Protective Security Advisor for the Department of Homeland Security, will provide timely insights on the actions that employers should take to keep their workplaces safe. Female executives often find themselves at a disadvantage when it comes to negotiating their executive compensation and employment incentives. This discussion on June 11 will focus on providing insight and guidance to females at all levels of their professional careers that may be unaware of the various compensation, incentive, legal and tax issues at play when moving up the ranks or when navigating a transaction involving her employer.